2. After the soaking period is over, put 2 cups water, 1 cup coconut milk and rice in the pan and let it boil on the stove for a few mins until boiled. 3. Lower the heat to lowest level and let it cook for 40 – 45 minutes. 5. In the last 10 minutes of cooking, add sugar and salt. 6. Put coconut flakes on small oven tray and let it roast/bake. It roasts quickly. Check it often. When it turns to light brown, take them out (about 5-7 mins). 7. 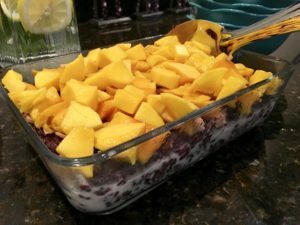 Pour the rice mixture in a serving plate, add coconut flakes and chopped mangos on top. Let it chill in the fridge. If you like it juicy, add coconut milk while serving. Enjoy!